Lay Z Spas are fantastic inflatable, portable spas. They look great, have lots of wonderful functionality, and can be both very relaxing and a lot of fun! However, no one wants to climb into a spa with green water, or water improperly managed. We have put together this article to cover proper Lay Z Spa water treatment, and to touch on the primary chemicals you’ll need to keep the water in your Lay Z Spa crystal clear and looking like it came straight from the South Pacific! 4.1 How Much Chlorine Do You Need to Add To Your Lay Z Spa? 4.2 Can You Use Chlorine Tablets with Lay Z Spas? 4.3 How Many Tablets Chlorine Tablets in Lay Z Spa? If the water in your Lay Z Spa is getting nasty, you can always just empty it out and refill. You should do this periodically, every few months at most, to keep your water fresh and clean. Often starting over with clean water will end up being cheaper than using more and more chemical treatments to get your spa water under control, and also likely friendlier to the environment. Regularly vacuuming your spa will help, as well! That said, emptying and refilling your spa is a lot of work, and will take time and energy to get your spa back up to temperature. Given that, your best bet is to try to stay on top of the water treatment of your Lay Z Spa, and catch problems before they get out of control. Here is a handy chart that outlines many of the common issues users have when dealing with Lay Z Spa water treatment. Water foaming Improper cleaning products used Add fresh water and shock. Lay Z Spa water treatment involves a few products, as outlined here. 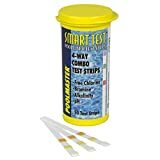 PoolMaster’s Smart Test Spa Test Strips are an excellent choice. The package includes 50 test strips and a chemical chart. The strips are very easy to use. Just take one out, dip it in the water, and wait a bit for the strip to change color. Hold the strip up to the chart, and identify the chemical composition issues in your water. Be sure your hands are dry when you take out a test strip! If you get water into the container, you will contaminate all of the strips, so dry your hands, take out one strip, and close the container before using the chart. Here are the basic targets for your Lay Z Spa Water Treatment plan. Lay Z Spa recommends using Chlorine on their spas, but either Chlorine or Bromine can be used to treat the water. Typically chlorine is used if the spa is located outside, and bromine if the spa is located inside, but you can use either. If you really want to dig into the weeds, you can read this article on the differences. 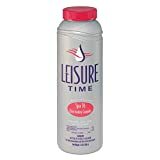 Regardless, we like the LeisureTime Chlorine Granules for your Lay Z Spa water treatment plan. This chlorine is designed for use in Spas, and (assuming your water is over 68’F, or 20’C) you just need to pour these granules right into the water, and they will dissolve. If you’re using this on fresh water that hasn’t been heated at all, you may want to dissolve the chlorine in a bucket with some hot water, and then pour it into the tub. Add a small amount at a time, and keep re-testing until proper levels are achieved. If you over-chlorinate, simply wait a few days for levels to fall, or add some additional fresh water. How Much Chlorine Do You Need to Add To Your Lay Z Spa? It’s difficult to say exactly, but the target is 3-5mg/l of Chlorine. Typically you’ll be adding Chlorine daily, from 1-4 level teaspoons, using less as you approach the appropriate level of Chlorine. Can You Use Chlorine Tablets with Lay Z Spas? You can use the 20g small tablets, but cannot use the 200g large Chlorine tables. In general, it’s best to stick with the Chlorine granules. They allow for finer adjustments and more functionality. How Many Tablets Chlorine Tablets in Lay Z Spa? If you choose to use 20g tablets, start with 2-3 tablets. If your water is way out of alignment, or if you have just added new water, you’ll want to shock it to bring it back into the desired range. To do this, you’ll need to use a Spa Shock treatment like this LeisureTime Renu2 Spa Shock. This Spa shock treatment will help clear away cloudy water, oils, deodorants, and other impurities commonly found in spa water. The chemical will destroy microorganisms while not negatively affecting pH levels. You’ll be able to use your Lay Z Spa or Coleman hot tub just minutes after treating with the spa shock chemical. After testing the pH level of your water, you will see whether you need to add Spa Up or Spa Down to balance it and get it at the appropriate level (7.2 to 7.6 pH). Spa Up and Spa Down will balance the pH of the water, which helps prevent cloudiness and keep the water at a comfortable level for soaking in. If you accidentally add too much and overshoot your target, add some clear water, or use some of the opposite chemicals to get things back in balance. It is generally helpful to have both Spa Up and Spa Down on hand to be able to adjust the balance as needed. Many parts of the world have hard water as a natural part of the water supply, though other areas don’t have to deal with this problem. Should you have hard water in your local area, it can be an annoyance when using pools and spas. The hard water often produces a nasty, scaley coating around the walls of the hot tub caused by calcium build up. If you need to fight hard water, then try a Scale, Metal, and Stain Control chemical like the Chlorox Pool and Spa Hard Water Treatment. The quantity added will depend on your hard water problem, and on the size of the spa. Generally, you’ll be adding about 0.5oz of the hard water treatment, monthly. Once you have the water chemistry under control, you should also consider filtration. 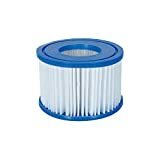 You’ll want to replace your filters every so often, as they can get clogged and stop functioning properly. Lay Z Spa units take Lay Z Spa Type VI filters. These units are easy to replace and help keep your water from getting cloudy. They can be cleaned, so you can try cleaning them before replacing them, but they should be replaced periodically. These also work on the Coleman line of Lay Z Spas. Lay Z Spa water treatment is not difficult, and with a few chemicals a basic test, and some filters, you can keep the water in your spa looking and feeling great, and ready for use at any time! I have very very hardwater and don’t know what to add in my saluspa. Can you please tell me what product and an estimate of how much I need to put in? You’re going to want a hard water treatment. Try the Clorox Scale Metal and Stain Control. It’s 16oz to 10,000 gallons, so depending on your SaluSpa size, you’re going to be adding something like 0.5oz to your spa, monthly.